Bedbugs are perhaps the most difficult pest to detect and control. Bed Bugs, or mattress bugs, are tiny flat, wingless, brownish-red oval-shaped bugs that feed on the blood of humans and animals. Adults are only about ¼ of an inch in length. Bed bug nymphs appear translucent but turn red after feeding and are 1/16 of an inch long. Bed bugs can hide anywhere and appear at night looking for warm bodies to feed. Their bites are painless and can go unnoticed with no visible signs or they may show redness and swelling within several days. Bed bugs are difficult to detect because they can hide in any crevice between feedings. They hide in places like mattresses and upholstery, furniture crevices, wood trim, box springs, curtains, baseboards, and even behind wallpaper and picture frames to name a few. They are also excellent hitchhikers, traveling on luggage, shoes, clothing, and second hand furniture. Since they only appear at night to feed on people as they sleep, you could have them staying at your house and not know. However, there are signs to look for that may indicate bed bugs. Signs of bed bugs include blood smears on bedding, brownish-black specs (feces), reddish colored exoskeletons, and musty secretion odors. When looking for bed bugs, inspect all crevices in and around beds and resting places. 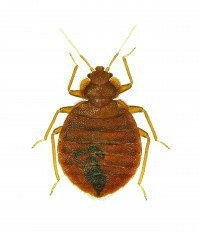 Bedbugs are extremely difficult to eliminate. Do-it-yourself bed bug control measures only have partial success and sanitation alone will not help. Your best bet is a professional pest control expert. Green T Pest Control experts will thoroughly inspect the crevices and sleeping areas of your home to determine the best and safest methods to eliminate the infestation. Call Green T or contact us today if you suspect a bed bug infestation. Click here to learn more about bed bug control.